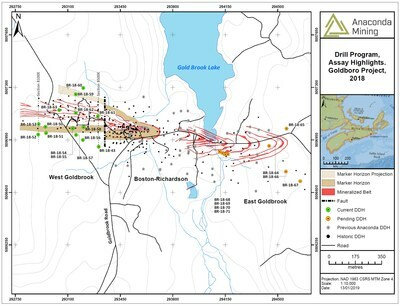 TORONTO, Jan. 14, 2019 /CNW/ - Anaconda Mining Inc. ("Anaconda" or the "Company") (TSX: ANX) (OTCQX: ANXGF) is pleased to announce additional results from the 10,000-metre drill program that began in July 2018 at the Goldboro Gold Project in Nova Scotia ("Goldboro"). 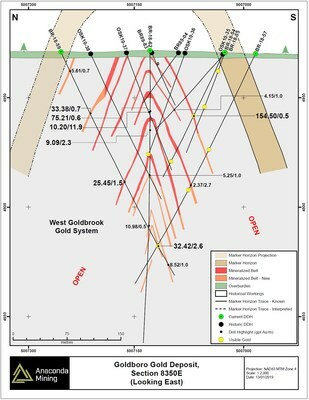 Fifteen drill holes (BR-18-50 to 63 and BR-18-43), totaling 4,866 metres (the "WG Drill Program"), successfully infilled the West Goldbrook Gold System ("WG Gold System") over 400 metres of existing strike length and extended the WG Gold System 200 metres to a depth of 450 metres, encountering 23 occurrences of visible gold and mineralization characteristic of the Goldboro Gold Deposit (Exhibit A, B, C and D). 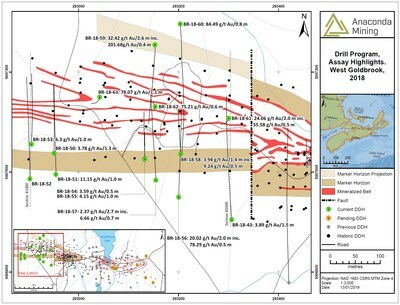 The infill portion of the WG Drill Program intersected mineralized zones in areas of known inferred mineral resources and demonstrated continuity of mineralization, providing the requisite geological data to potentially convert those inferred resources to the indicated category (Exhibit A, C and D). 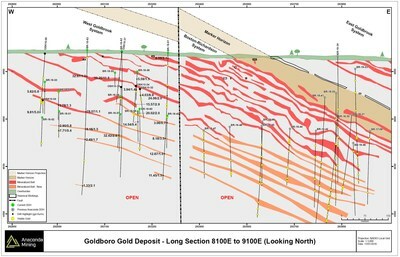 Expansion drilling intersected the host fold structure, alteration and mineralization to a depth of 450 metres, demonstrating that the deposit continues below the previously modeled WG Gold System (Exhibit C and D). All samples and the resultant composites referred to in this release are collected using QA/QC protocols including the regular insertion of standards and blanks within the sample batch for analysis and check assays of select samples. All samples quoted in this release were analyzed at Eastern Analytical Ltd. in Springdale, NL, for Au by fire assay (30 g) with an AA finish.